Tomato plants are a popular garden plant due to their ease of growing and plentiful fruit production. The plants grow well in a hydroponics system placed in either an indoor or outdoor location, as this type of growing system lowers the risk of disease and pest problems. 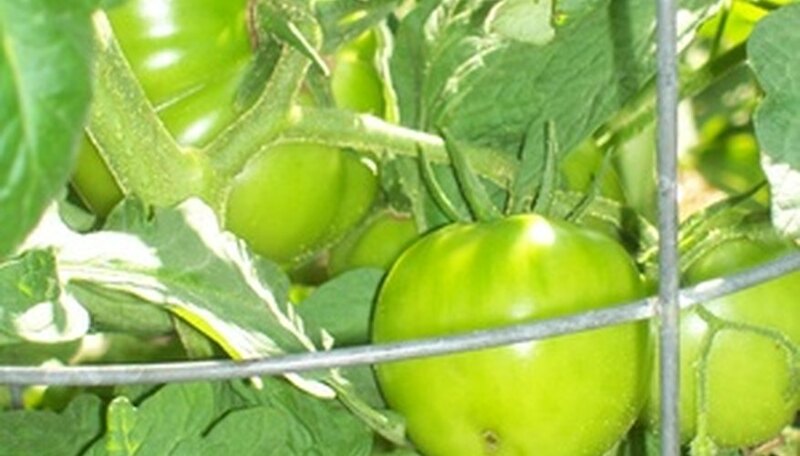 Tomato plants thrive growing in a hydroponics system, where it is easy to control the amount of nutrients supplied to the plants, compared with a soil garden. Set up the hydroponics system outdoors in an area that receives morning sunlight and has access to an electrical plug to power the water pump. Place the hydroponics system under a sunshade if the area receives hot afternoon sun to prevent sun scald on the tomatoes. Fill the hydroponics system with water and start the pump to verify everything is in working order. Cover the pump with a plastic container to prevent it from getting wet. Set a rock or weight on top of the container to prevent it from blowing off. Test the water pH to verify it is 5.8 to 6.3, as tomato plants grow best in this pH. Raise the pH level with potassium hydroxide and lower it with phosphoric acid according to the package instructions based on the water volume in the hydroponics system. Remove the tomato seedlings from the growing container and remove as much soil as possible. Rinse the roots gently with water to remove as much soil residue as possible. Set the growing pots in the hydroponics system at a space of 10 inches apart for tomato plants. Fill the bottom of the pots with hydroponics growing medium, set the root structure of the tomato seedling into the pots and fill medium around the root system to hold the plants in place. Monitor the water levels in the hydroponics system, as the evaporation rate increases when the plants grow outdoors. Add water to the system as needed, and replenish the nutrients to maintain an appropriate level.